Lindisfarne Bed & Breakfast accommodation overlooking Stromness harbour. Welcome to Lindisfarne Bed & Breakfast Accommodation! 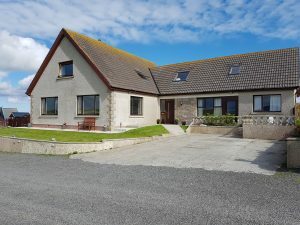 Lindisfarne is a detached house set in a rural location over-looking the town of Stromness with views of scapa flow, the island of Graemsay, Hoy hills and the island of Hoy. Stromness is approximately one mile from the house and has all the local amenities you will require including shops, cafes, pubs, restaurants along with many tourist attractions. The main bus route is only a 2 minute walk away from the accommodation.